Revamped for 2017, the Nissan Armada is the brand's flagship SUV, a 3-row brute that boasts plenty of room and capability for active families. 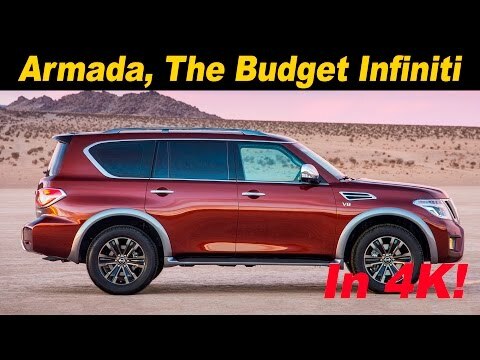 With a powerful V8 and a slew of comfort and safety features, the Nissan Armada offers a lot of vehicle for its roughly $45,000 starting price but still faces stiff competition in the Chevrolet Tahoe. Luxury on a budget for the whole family. I love my 2017 Nissan armada. We bought it because of our expanding family. It accommodated all of us, plus friends, with a third row seat. Grocery shopping is a breeze since the third row folds down flat. We have towed a trailer with this vehicle and you cannot even feel the weight behind it. The new body style really was a selling feature for me. It is definitely a luxury SUV, without a six figure price tag. Best SUV with biggest third row seating. I love my armada. It is a roomy car to fit my family of five. We purchased this vehicle because of the space in the third row. It has the most room of all the competing SUVs. The air conditioning & heat ventilation is the best for the back too. The technology is fun on this car. It drives well, smooth ride, easy to park. My favorite feature is the cameras for easy parking & backing up. This is the best car to own for those who want a functional, safe, luxury SUV. The car is extremely comfortable and reliable. My family and I are quite safe in the car. It has amazing comfort, but also safety and drive features which I did not have in my other cars. Love the keyless entry, remote start, and hands-free back door control. Power third row seats are a must and amazing. Driver safety, numerous cameras, and radar keep my family safe. 2017 Nissan Armada First Drive Review - In 4K UHD!